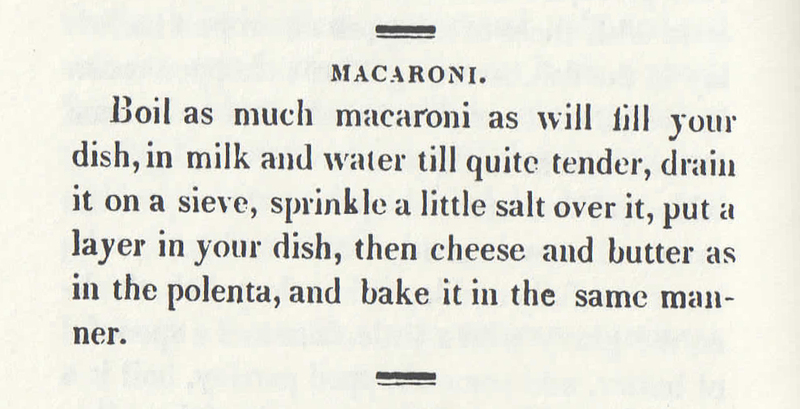 Here is a recipe for macaroni from The Virginia House-wife by Mary Randolph (1824). The Virginia House-wife was the first cookbook ever published in America and became one of the most influential cookbooks of the nineteeth century. Mary Randolph, the author, moved to Washington DC in 1819 where she then wrote The Virginia House-wife. Her brother Thomas Mann Randolph was the son-in-law of Thomas Jefferson, the man many credit for bringing macaroni to America. Other interesting facts – she was a decendant of Pocahontas and is the first recorded person to be buried in Arlington National Cemetery in 1928. José Andrés, a collector of old cookbooks gave me this recipe for the Mac and Cheese he likes to make for his daughters – it’s quick and easy and so much tastier than anything out of a box. For more from José Andrés, including my Q&A with him about American food and Made in America go to America Eats. Boil pasta and add enough good quality olive oil to coat the noodles but without making them greasy. Stir in the creamy Greek yogurt so the noodles are well coated. Using a microplane (which gives the hard cheese a lot of volume) grate a strong flavored cheese (Parmesan) over the top. Stir in the cheese to make a rich creamy cheese sauce, season with salt and pepper and serve immediately with a few micro chives. It really doesnt get any better then that.